Testimony of Dr. Benny Peiser before the US Senate (Environment and Public Works Committee SD-406, 02 Dec 2014: "If you ever wanted to develop a policy that is most damaging to your country and your industry, you could'nt have made a better policy than that that the Europeans have adopted." Maximum warming occurs about one decade after CO2 emission New paper findings. Strange that the trend of global temperatures is flat since ~18 years, despite rising CO2 mixing ratio. Unhealthy Exaggeration Read former IPCC reviewer Indur Goklany's critique of the WHO report on climate change, which exaggerates several fold the risks of an assumed climate change for the period 2030 to 2050. Short video here. Critical Thinking on Climate Change USA Senate minority report (Sep. 2014), 98 pages. 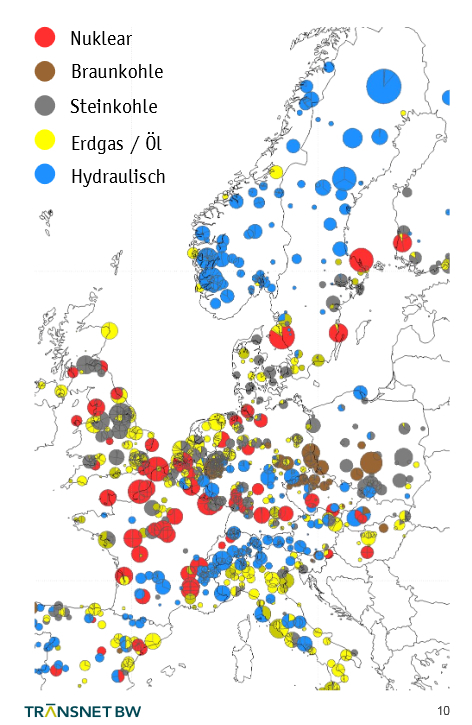 Hydraulic Fracturing in Deutschland Excellent presentation (in German) by Dr. Wrede from the Geological Service of NRW: crystal clear, sober and objective! (23 minutes, from the 8th EIKE conference). Why wind power does not deliver the expected emissions reductions Paper by Inhaber and discussion here. Wind Turbine Syndrome Will Wind Turbine Syndrome (WTS) become the killer of new windmills? Probably not even if Health Canada said : “the findings support a potential link between long-term high annoyance and health.” Read comment here, full report description and summary of the 2014 report. What is the optimal atmospheric CO2 concentration? Important small video with interview of Prof. William Harper (Princeton University) on the optimal atmospheric CO2 concentration (mixing ratio). Watch also this longer lecture from 2010 "CO2 friend or foe?" and this recent conference from October 2014. A meta-analysis on the impacts of genetically modified crops Nothing to do with climate, but interesting report by Klümper & Qaim: . "On average, GM technology adoption has reduced chemical pesticide use by 37%, increased crop yields by 22%, and increased farmer profits by 68%"
Most of the recent warming of sea surface temperatures can be explained by PDO, AMO, El Nino by Dr. Roy Spencer. The Scientific Method by Richard Feynmann . Watch the first seconds of this video ... you can't do that too often! Watch this interview (in German) on the subject of "Klimaangst" with Prof. Bandelow, an Angst-researcher and chairman of the "Deutsche Gesellchaft für Angstforschung". Bill GATES "Poor countries ... desperately need cheap sources of energy now to fuel economic growth that lifts families out of poverty. They can't afford today's expensive clean energy solutions and we can't expect them to wait for the technology to get cheaper." The Climate's Scam Meltdown Strong worded article by marine biologist Walter Starck in Quadrant Online: "The rent-seekers, opportunists, third-rate academics, carbon-market scam artists and peddlers of catastrophic prophecy can see the alarmist bubble deflating, so they're trying harder than ever to sustain the scare. Problem is, Mother Nature isn't cooperating"
Embarrassing predictions haunt the global warming industry A. Newman writes in the New American about climate-related predictions that went wrong. Why don't we see a global temperature change caused by the annual change in TSI? Very interesting article by Dr. Robertson on why we do not see a global temperature variation caused by the 22 W/m2 annual total solar irradiance variation. Geo-engineering by HFC's ? A new Tambora style volcanic eruption (or a nuclear winter) threatens to cool the planet? Don't despair, we will pump HFC's in the atmosphere to produce geo-engenieered global warming! Read here! On the IPCC Synthesis Report ... in Spiegel online: Beim Weltklimarat geht Alarm vor Genauigkeit. "...unterschlägt der neue Synthesereport wesentliche wissenschaftliche Erkenntnisse." Full report here. Comments here, here, here. Wind energy assessment Very interesting paper on wind energy in the UK and Northern Europe by Dr. Capel Aris: "Although it is claimed that the wind is always blowing somewhere in the UK, the model reveals this ‘guaranteed’ output is only sufficient to generate something under 2 % of nominal output" and in Germany with 54 GW capacity installed in 2011 "The secured capacity that was available in 99.5 percent of all hours was only 0.9 gigawatts". Banning Argon? Does EPA want to ban ARGON? Read here and here, and wonder how ignorance rules environmental politics! Das „Treibhaus“ treibt Journalisten in die Glaubwürdigkeitskrise. Dr. Wolfgang Thüne: "Die Journalisten konnten der Versuchung nicht widerstehen, erfüllten die in sie gesetzten Erwartungen, betrieben die „Skandalisierung“ von Umweltproblemen, prangerten die „Schuldigen“ öffentlich an und inszenierten im Muster simpler Mythen ein Schauspiel „das Gute im Kampf mit dem Bösen“, bei dem der Leser sich immer auf die moralisch richtige Seite der „Guten“ schlagen konnte." Read the annual GWFP lecture by Owen Paterson, former Environment Secretary. "To summarise, we must challenge the current groupthink and be prepared to stand up to the bullies in the environmental movement and their subsidy-hungry allies...I am saying that we may achieve almost as much in the way of emissions reduction, perhaps even more if innovation goes well." Read comments here , here and here. Bedarfsanalysen Reservekraftwerke Winter 2014/15 Very interesting, very technical and not easy to read report of the BNA on German electrical power net stability/security in winter 2014/15. Conclusion: "Betrachtete Szenarien zeigen eine massive Gefährdung der Sicherheit und Zuverlässigkeit des Elektrizitätsversorgungs-system...Keine ausreichende Sicherheitsseserven zur Beherrschung weiterer kritischer und unerwarteter Situationen." Click here for interesting figure of EU power stations. Is low energy density the solution for the planet? Read this excellent comment on Noami Klein's latest book. "Whenever we use energy it is to free ourselves from some natural condition: to be warm in winter and cool in summer, to stay up after dark, to eat out of season, to escape hard labor, to leave the local patch of terroir where we sprouted and see the world." Should other nations follow Germany's lead on promoting solar power? Ryan Carlyle in FORBES says NO. "If Germany’s neighbours also had as many solar panels, they would all be trying to export and import at the same time, and the system would fall apart." Read also the Medium-Term Market Renewable Energy Report 2014 of the IEA and this comment "When Green Dreams Beget Brown Nightmares". Goldgräberstimmung am Ende Watch this SRW video on the disappointing revenue from wind turbines. "Die Erträge von 2/3 aller Anlagen sind schlecht bis sehr schlecht". Climate science is not settled Read this comment in the online WSJ by Dr. Koonin, former undersecretary of Science of president Obama. Are climate models fit for political decision making? - What can we learn from climate models? (2012): "A completely general, all encompassing climate model that is accepted by all scientists and is fit for all purposes seems to be an idealistic fantasy". - State of the Climate Debate (2014) : "Oversimplification undercuts the political process and dialog necessary for real solutions in a highly complex world & torques scientific research through politization and funding priorities"
An Unsettling Climate Rupert Darwalls article on Prof. Murry Salby whose inconvienent CO2 theory caused him to be sacked from his university. "As an academic critic of the science on which AGW rests, Murry Salby may have been silenced for now. The observed behavior of nature, from which he draws his analysis, cannot be dismissed so readily." Blog comment on Prof. Salby's conference. Recent presentation before the UK parliament. Once upon a time there was a dying forest Read this caustic paper by Heinz Horeis in Elsevier's "Technology in Society" (31, 2009, 111-116) on the German Waldsterben panic. "Only artificial respiration is keeping the idea of Waldsterben alive... Waldsterben was not a scientific hypothesis. It was primarily a political motivated slogan which served as a means to receive research money and to achieve certain political goals." Does this ring a bell when you read of Global Warming or Anthropogenic Climate Change? (paper is pay-walled, but may be accessed by subscribers to the BNL on-line journals or free subscription to Researchgate). H.t. Notrickszone. Spain's Photovoltaic Revolution Interesting book at Springer by Pietro & Hall. Introductory text: The authors' comprehensive analysis of energy inputs, which assigns energy cost estimates to all financial expenditures, yields EROI values that are less than half of those claimed by other investigators and by the solar industry. "Modern renewable energies, supposedly born to support a sustainable world, became one jewel of the most unsustainable of human activities, financial greed." In a time of widespread violence and disease, good news is no news. Read this excellent comment by Matt Riddley: "When asked what I most worry about, I always reply “bureaucracy and superstition"". Evidence for Distinct Modes of Solar Activity Important new paper by Usoskin & al. The graph of sun spots shows that the period from 1950 to 2000 corresponds to a "Grand Maximum Mode"... and it also was a period with observable global warming! Public discussion on nuclear energy ... of the "Inspiring Australia" initiative; excellent speakers and mostly interesting Q&A. Look here for the World Nuclear Association information library. IVANPAH thermal solar plant Power Magazine has an interesting report on the gigantic IVANPAH thermal solar plant in California, which was nominated "plant of the year". Quite an engineering marvel, but note the enormous land usage, lack of thermal storage and rather disappointing efficiency (28.7%, traditional thermal stations have ~43%). 9th International Conference on Climate Change Watch the presentations and keynote adresses of the 9th International Conference on Climate Change by the Heartland Institute. Even if you are a AGW believer, take the time to watch and listen to what "other" great scientists have to say. Treading water Excellent comment by Dr. Roger Pielke Jr. discussing the fact that the proportion of carbon free energy in the global energy consumption has reached a plateau of ca. 13% since ~1995. "Those who claim that the world has turned a corner ... or that they know what steps will get us around that corner are dreamers or fools. We don't know." Enervault First Megawatt-scale iron-chromium redox flow battery on grid. Will the flow battery be the cure to intermittency of solar and wind power? Wissenschaft in der Klimapolitik Prof. Hans von Storch: Die Mitte in der Zange der Extremisten. "So gibt es Tendenzen in der Klimawissenschaft, den Aspekt der politischen Nützlichkeit oder der Konsistenz mit dem Zeitgeist zuungunsten von Offenheit und Falsifikationsbemühungen in den Vordergrund zu stellen....Die Mitte der Wissenschaft wehrt sich nur eingeschränkt gegen die permanente Einvernahme durch Alarmisten, Umweltorganisationen und interessierter Wirtschaft..."
CO2 emissions per head since 1965 China trumps all... and the European emission reductions well may be futile! Russian hackers target the energy sector ... including wind turbines and biogas plants. Time to Change: Climate Science Reconsidered The University College of London (UCL) has published a large 156 pages report : "Active critical self-reflection and humility should become the evident and habitual cultural norm on the part of all participants in the climate discourse.". Well said! The Church, climate change and the shadow of Galileo Crystal clear comment by Phil Lawler in CatholicChurch.org. "Too many Catholic officials have already jumped aboard the bandwagon, insisting that action to stop climate change is a moral imperative." Climate Change: The Need to Act Now Watch this interesting hearing of the US Committee on Environment and Public Works. (> 2 hours). Listen carefully to all statements! New report by the Brookings Institute. "...assuming reductions in carbon emissions are valued at $50 per metric ton and the price of natural gas is $16 per million Btu or less nuclear, hydro, and natural gas combined cycle have far more net benefits than either wind or solar.".. "A new nuclear plant becomes the most favored alternative. Wind and solar continue to rank fourth and fifth among all the alternatives, mainly because of the very high capacity cost and the very low capacity factor." Periodicities of solar activity and the surface temperature variation of the Earth and their correlations. (Chinese Science Bulletin 11434, June 2014) Yet another new scientific paper showing the solar influence on Earth's climate by ZHAO X H, FENG X S.. Read comments here "The authors of the new paper say that the climate models of the IPCC underestimate the impact of natural factors on the climate change and overstate that of human activities". Read also this paper which concludes: "Using 150 yr of sea surface temperature data from 1854 to 2007 and an objective method, we found a robust signal of warming over solar max and cooling over solar min." Why Climate Change Doesn't Scare Me Very readable article by W. Starck in Quadrant Online: "A far bigger worry is the corruption that has turned 'science' into a synonym for shameless, cynical careerism." The Pause in Global Warming: Climate Policy Implications Presentation by Prof. Ross McKitrick (PDF, video here). "There is a prima facie case that the social cost of carbon has been overstated... The uncertainties will be largely resolved in the next 2-4 years...There is no downside to waiting for this, and considerable upside." Testimony of Prof. Botkin (U. of California, St. Barbara) ... to the House Subcommittee on Science, Space and Technology (29 May 2014). An absolute must read! Global Warming: the 97% Fallacy. Read this excellent comment on SPIKED. Read also this interview with one of Greenpeace founders Patrick Moore: Environmentalism has become a religion. The FACE project Is more CO2 good for the Amazon rain forest? National Climate Assessment Report The very alarmist report published by the US government makes many ripples. Despite the general media hype many scientists do not agree. Read the comments of Dr. Roy Spencer (UHA) and Prof. Judith Curry (Georgia Institute of Technology). Also this 134 page report by Pat Michaels/Chip Knappenberger titled "The missing science from the draft ..." Read scathing rebuttal by 15 scientists here and other comment here. Interview with Prof. Lennart Bengtsson Very interesting interview with Prof. Lennart Bengtsson by Hans von Storch in his blog "Die Klimazwiebel". Prof. Bengtsson who joined the GWPF advisory board: "I have increasingly been disturbed by the strong tendencies to politization that has taken place in climate research in recent years". Read also here, here and here. 14 May 2014: Prof. Bengtsson resigned from his membership after being threatened à la Mc. Carthy by other "climate scientists". Read here, here, here, here. Climate Alarmism is a Belief System Read "The Bath Lecture" by Nigel Lawson. Energiewende ins Nichts Interesting conference (in German) by Prof. H-W. Sinn (Uni München). Prof. Sinn is a strong believer in AGW (in my opinion a somewhat naive believer) but gives crystal clear numbers which show that the EEG is utopia; he foresees a strong return to nuclear energy in Germany: "Die einzige Lösung des Klimaproblems ist die Atomenergie". Read another comment on the EEG here. The World's Resources Aren't Running Out ... writes Matt Riddley in the WSJ. "In many respects, greater affluence and new technology have led to less human impact on the planet, not more." Climate outsider finds missing global warming ... writes Sciencemag. Even if correct (what has to be re-checked) "their" warming amounts to not more than 1.2 °C/century... hardly a catastrophe! Models behaving badly Interesting comment by Dr. David Whitehouse: "The models that were poorly representing reality were being used to increase the spread of possible outcomes to a point where it covered the pesky observations. Popper had been spun in his grave because of his belief that theories and models should be attacked by data instead of protected from them." The 50:1 project Watch these videos with interviews of scientists, journalists, economists... on anthropogenic global warming. Do solar PV modules emit more CO2eq than modern coal power stations? Very interesting research by Dipl. Ing. (ETH) F. Ferroni: Solar PV modules may emit more CO2eq than modern coal power houses! (978 versus 846 g. CO2/kWh). This paper from 2007 gives a very large range for PV of [50 - 300] CO2/kWh (not CO2eq, so the emissions of NH3 and SF6 during PV manufacture seem to be ignored...) and this 2011 BNL paper gives the usual numbers [30 - 40]. Norman Borlaugh, the father of the green revolution, would be 100 now He said: "One of the greatest threats to mankind today is that the world may be choked by an explosively pervading but well camouflaged bureaucracy." Does that ring a bell? The rate of sea-level rise. A new paper in Nature Climate Change acknowledges that sea-level rise per year has fallen by 30% during the last decade. See comment here. A near miss! A 2012 solar superstorm comparable to the 1859 Carrington event could have wiped out communications! Read discussion here and here. Heute Show satirical video on the German Energiewende. Something more funny for our German fluent readers: watch here the humoristic emission "Heute Show" from public station ZDF making fun of the derailing EEG (h.t. notrickszone). Read also this article of Prof. Vahrenholt "Ohne Kurskorrektur wird die Energiewende scheitern" (Deutscher Arbeitgeber Verband). The Deliberate Corruption of Climate Science A new book by famous climate realist Dr. Tim Ball ( a retired professor of the University of Winnipeg). You might not agree with all arguments, but this book shows that a politicized science can not but loose its innocence. Read a short discussion here . A Sensitive Matter New important report by Lewis & Crok (with a foreword by Prof. Curry): . How the IPCC buried evidence showing good news on global warming. "We suggest a best estimate of transient climate response of 1.35°C". (i.e. +1.35°C is the best estimate for the expected warming due to a doubling of atmospheric CO2). Read also here. EEG abschaffen! ... raten die EFI Experten. Schlussfolgerung hier. *** (Feb. 2014) Komplett-Text des EFI 2014 Gutachtens über linken Hyperlink. Patrick's Moore testimony (25 Feb 2014) before the US Senate Dr Patrick Moore, a co-founder of Greenpeace, made a testimony (25 Feb 2014) before the US Senate: "There is no scientific proof that human emissions of carbon dioxide (CO2) are the dominant cause of the minor warming of the Earth’s atmosphere over the past 100 years." Transcription of the APS statement on climate change. The APS (American Physical Society) is revising its 2007 statement on climate change. It held a workshop on that matter. The transcription (over 300 pages!) makes for a very interesting reading, as many well known scientists from both camps (Christy, Curry, Lindzen, Santer...) spoke out in a very civilized manner. The conclusion seems to be "we don't know..."
95% of the climate models agree: the observations are wrong! Read this caustic comment by Dr. Roy Spemcer (UAH):: "And if humans are the cause of only, say, 50% of the warming (e.g. our published paper), then there is even less reason to force expensive and prosperity-destroying energy policies down our throats. " Europe's stark renewables lesson Read R. Darwall's article in WSJ. EU commissioner Oettinger speaks against the -40% CO2 planned reduction scheme: "... those who expected the cut to “save the world” were (are) “arrogant or stupid”" (Euractiv). Watch this video comment. HOC Energy and Climate Change Meeting of the UK Parliament Video. Participation of Prof. Lindzen, Dr. N. Lewis and author Donna Laframboise. Climate Change’s Inherent Uncertainties Excellent article by Prof. Garth Paltridge in Quadrant Online: "... we have at least to consider the possibility that the scientific establishment behind the global warming issue has been drawn into the trap of seriously overstating the climate problem." Will the EU's decision to dilute green energy targets significantly help European business? Read two opposite answers here (also another comment here). 2014 Gates Annual Letter Read this very interesting letter by Bill Gates: "3 myths that block progress for the poor"
Electricity from coal... ... makes 45.5% of Germany's electrical energy. All the solar covered roofs and industrial solar farms just deliver 4.5% (in German). Is distributed generation (DG) really the future? Very interesting article in the Jan. 2014 edition of Power Magazine by Ted Nordhaus et al. "If you want to know what utilities actually object to about DG, itis policies that functionally require them to purchase power fromsolar homeowners at $0.30/kWh when they don’t need it insteadof buying it on the wholesale market for $0.04/kWh when they do." Decreasing Solar magnetic field ... points to possible vanishing sunspots around 2020. Will this be a repeat of the Dalton or even Maunder minimum with severe global cooling? "As time goes on a link between decreasing solar activity and the halt in global warming 17 years ago becomes harder and harder to deny." "Climate models are unable to resolve the effect of anthropogenic GHGs...Global air temperature projections presently have no predictive value....Detection and attribution currently remain impossible"
Are cloud anomalies the cause of the 1980 - 2000 warming? Observational data suggest that cloud anomalies could be the cause of the 1980-2000 warming. Read here for German text. English translation and discussion from blog http://www.notrickszone.com. Comment of Prof. R. Lindzen for the UK parliament The UK parliament invited comments on the latest IPCC AR5 WGI report. Read the excellent contribution of Prof. R. Lindzen (MIT) : "The claim that 51% of the small warming over the past 60 years is due to man’s activities is completely consistent with there being no problem worth bothering about." The list of all comments is here. On Carbon Tax increase Richard Tol (economist) on carbon tax increase: "An increase in taxation is, I think, a reasonable starting point. Others disagree. In any case, the economic damage done by a tax is roughly proportional to the square of the level of the tax. Therefore, if you want to increase taxes, you should increase those taxes that are currently low (e.g., a carbon tax). If you want to keep taxes as they are, you should decrease those that are high (income, capital, consumption), and increase those that are low (carbon). If you want to reduce taxes, a carbon tax would still allow for deeper cuts in income taxes etc." Wie Windräder die Umwelt zerstören. by Oskar Lafontaine. Read this unsuspected comment in the FAZ (12 Dec 2013): "Es ist ökonomisch und technisch unsinnig, auf einem Weg weiterzugehen, der den Kohlendioxidausstoß steigert, den Strompreis erhöht und dessen Ziel bei intelligenterer Technik einfacher und billiger zu erreichen ist." Why Humans Don't Have Much To Do with Climate Change Read this article in the Huffington Post (09 Dec 13): "the global warming scientists -- with their models defunct and now acting on hope rather than science -- assert that temperatures will soon renew their climb. The global cooling scientists assert the opposite." Global Warming = Climate Change II Very clear paper by Ed Hoskins . Read also this older comment by Tony Brown "The futility on carbon reduction?" on Judith Curry's blog. Hexenverfolgung und Klimawandel Excellent article by C. Seidel in the FAZ: "andererseits bleibt es erschreckend, wie die Menschen, wenn der Wahnsinn herrscht, sich ihm lieber unterwerfen, als seine Grundlagen anzuzweifeln." Die Alpen trotzen der Klimaerwärmung Dominik Jung (meteorologist): . Read also this comment in the meteoLCD blog! Excellent presentation by Matt Ridley, the author of the book "The rational optimist": "The precautional principle says <Let's not try anything for the first time>"
A new Dalton minimum is more likely than not Prof. M. Lockwood (Uni Reading): The risk of a new Maunder minimum is 25-30%. TEMPERATURES OVER THE LAST 1000 YEARS RELIABLE? A complex but interesting paper by McShane et al. on the skill of temperature proxies and uncertainty of models: "Climate scientists have greatly underestimated the uncertainty of proxy-based reconstructions and hence have been overconfident in their models." Will Cooling Temperature And Economic Climates Finally Take The Wind Out Of Failed Energy Policies? Read this comment by Prof. L. Bell (Uni Houston) in Forbes online. Massive Blackouts! Coming soon to you ? Read here and here about the gigantic costs! Climate Change Reconsidered II: Physical Science The new NIPCC report. Read this 7 chapter report written by independent scientists. 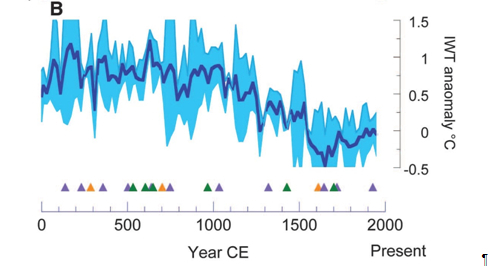 IWT of Pacific Ocean IWT (intermediate water temperature) of Pacific Ocean was a lot warmer than today during the Roman and Medieval warm periods. From latest paper of Rosenthal et al.(Science). Read also this paper by D. Pangburn which explains temperature anomalies with a simple equation containing the integral of sun-spots (CO2 influence is minimal). Also here. New paper on Finnish/Sweden summer temperatures shows Roman and Medieval periods not colder than today. Where is the CO2 driven anthropogenic warming? Climate model failure Climate models: a spectacular model failure from Canada. Coal on the rise See how EU efforts to curb CO2 emissions become futile compared to new planned coal-fired installations in Asia (India and China). Click here and here. IPCC models getting mushy Prof. Ross McKitrick (Uni Guelph) in Financial Post: " this is obviously no time for entering into costly and permanent climate policy commitments based on failed model forecasts." Renewables and intermittency New paper finds by modeling that they can power the grid 99.9% of the time if you build 290% of the needed capacity ! Read clear comment "Renewable intermittency is real" here: German data suggest that Germany would need to install >1000% of the load !!! " ...for the near term at least, clean conventional generation from gas and nuclear will be indispensable to back up growing renewable output if the goal is to reduce carbon emissions." Read also: Die Energiewende scheitert an der Physik. And also the big "Windenergie Report 2012"of the Fraunhofer Institut : "Maßnahmen des Einspeisemanagements werden immer häufiger erforderlich. Die abgeregelte Leistung verdreifachte sich 2011 auf etwa 1 % des Jahreswindertrags. Die Entschädigungsleistungen stiegen von 10 auf 33,5 Mio €." On the Present Halting of Global Warming. New paper in the new journal "Climate" by Prof. Akasofu: 0.23 °C cooling predicted for 2030 ! ion-nucleation New paper by H. Svensmark et al. on cloud formation by cosmic rays: "It is proposed that an ion-mechanism exists which provides a second significant pathway for making additional H2SO4"
Spiegel Online must-read: : "This year, German consumers will be forced to pay €20 billion ($26 billion) for electricity from solar, wind and biogas plants -- electricity with a market price of just over €3 billion". "Global Warming has become a religion. A surprisingly large number of people seem to have concluded that all that gives meaning to their lives is the belief that they are saving the planet by paying attention to their carbon footprint." Mineral carbonation Is CO2 mineralization the death-blow to CCS (Carbon Capture and Storage)? Read here, here, here and here. Important new paper in NATURE explains recent lack of warming by cooling eastern equatorial Pacific. Comments by J. Curry here. Provisional conclusion: 20th century warming has at least half natural causes! Read also here and here on another Nature paper on "Overestimated Global Warming..." Read also this comment by statistician John Brignell The Zombie Theory. Read also this new paper by de Freitas & McLean on the influence of ENSO on global temperature. "All other things being equal, a period dominated by a high frequency of El Niño-like conditions will result in global warming, whereas a period dominated by a high frequency of La Niña-like condi- tions will result in global cooling." Scientists and motivated reasoning Great comment by Prof. Judith Curry from Georgia Institute of Technology. Nuclear Waste Prof. Barry Brook (University of Adelaide) has a very interesting four part series on Nuclear Waste.. and why it might be so valuable! Gravity Power Is simple gravity storage one solution to Germany's Energiewende problems? Read article here and note that the big cylinder has > 30m diameter and goes >500m deep (i.e. crosses the groundwater aquifer). Gravity Power website. German slideshow. Zeit zur Rückbesinnung An article by Francis Massen published in the weekly "Letzebuerger Land" (link to text-only PDF). Aug. 2013. A likelihood perspective on tree-ring standardization: eliminating modern sample bias New paper in Climate of the Past by J.Cecile & al. showing that tree-ring dating on last 300 year old trees has strong positive and negative bias (abstract). This means that paleo-climate temperature reconstructions from tree rings may be invalid! Chelyabinsk meteor Very interesting video by NASA on the dust cloud propagation after the explosion of the Chelyabinsk meteor in Feb. 2013. Vårt eget fel (Our own wrong) Dissertation by Swedish historian Dr. David Larsson Heidenblad on climate alarm and collective guilt: : "The starting point of this study is the striking similarities between late modern notions of anthropogenic climate change and premodern ideas about divine punishment". Abstract (contains link to full text in Swedish). Antarctica Sea Ice brakes all records ... of max. extension. Earthquakes release methane Yet another natural Global Warming pusher! Tabletop Nuclear Fusion Is Cold Fusion making splashes again? Read here of the ICCF-18 congress of the University of Missouri and here a longer article on a CBSNews "60 minutes" emission "Cold fusion is hot again". Solar and planetary oscillation control on climate change: hind-cast, forecast and a comparison with the CMIP5 GCMs. New important paper by N. Scafetta from Duke University on solar/astronomical causes of climate change: "... about 50-60% of the warming observed since 1850 and since 1970 was induced by natural oscillations likely resulting from harmonic astronomical forcings...Today, the AGWT (Anthropogenic Global Warming Theory) consensus appears to be an accident of history promoted since 2001". New paper in Nature Geoscience says Arctic and Antarctic ice change could be natural. Read also here. Eco-Blowback: Mutiny in the Land of Wind Turbines Article by M. Schulz in Spiegel Online International. "The wind turbines, whose job it was to protect the environment, are not running smoothly" (12 July 2013). Read also this Forbes article on Spanish wind. The Age of Global Warming is Over Article in Quadrant Online by Prof. P. Collits from the University of Southern Queensland. The author also discusses the latest book of R. Darwall (see my blog). Environmental risks regarding the use and end-of-life-disposal of CdTe PV modules Report by the Norwegian Geotechnical Institute on the problems of disposing thin layer photovoltaic modules containing the toxic cadmium CdTe compound: "Leaching test at lower and a more environmental relevant pH (<8) is expected to provide an increased leaching of cadmium, and at a level that likely exceed the limit for ordinary landfills." Perihelion precession, polar ice and global warming Read this new paper by Prof. Duncan Steel in the on-line Journal of Cosmology. Changes in Earth's perihelion can explain Arctic warming and Antarctic cooling: "This mechanism represents a supplementary – natural – contribution to climate change in the present epoch and may even be the dominant fundamental cause of global warming, although anthropogenic effects surely play a role too.". Attention: this paper is not an easy read! Watch this exposé by Prof. Barry Brook from the University of Adelaide. An evidence-based approch to pricing CO2 emissions. A new paper by Prof. Ross McKitrick, proposing a carbon tax whose rate depends on the measured rise of tropical troposphere warming. Is the Electro-Magnetic-Pulse (EMP) the biggest threat to the electrical grid? Test with Thorium-MOX fuel have started in Norway Important news on the Thorium front-line. Read also here. Interested? Then read the book SUPERFUEL. New GRL paper on the global fertilization effect of CO2 by Donohue et al. (pay-walled. Picture shows positive trend in foliage cover (green to blue means increase! ): " ...14% increase in atmospheric CO2 (1982–2010) led to a 5 to 10% increase in green foliage cover". Global warming as a 21st century religion Read this article by Peter Lilley in the Huffington Post, UK: "What most clearly distinguishes the Catastrophic Global Warming cult from science is that it is not refutable by facts." Wind farms gone wild The "Scottish Wild Land Group", a society dedicated to environmental protection, has published a special issue of its magazine. They estimate the CO2 savings by all UK wind farms at 1/5000 of global emissions. In Luxembourg the contribution of electricity from wind turbines oscillates around 1.1 to 1.4 % of the national consumption, and seems independent of the number of built wind turbines. Relationship between Greenhouse Gases and Global Temperature Watch the exceptional presentation given by Prof. M. Salby (Macquarie University) in Hamburg (18 April 2013). See also the blog for some comments. Epic failure: 73 climate models all get it wrong! from Dr. Roy Spencer of UAH. The Intolerance of Climate Change Zealots Iain Dale (UK political radio commenter): "In the 1980s we had politicians who were able to expose these zealots for what they were. We now have cabinet ministers who go along with them and give them money." Und sie erwärmt sich doch If you shuddered and froze in these pre-summer days, read this "climate-skeptics" bashing brochure of the German Umweltbundesamt (UBA). Also a comment here, here and statements of the Deutscher Journalisten Verband, the WPK and EIKE. Article in "Die Welt der Fertigung" (online magazine of the German industry) by meteorologist K-E. Puls: "Eines scheint mittlerweile immerhin klar zu sein : Die Erderwärmung ist vorbei." The European Pollutant and Transfer Register ... has been updated. Let's not argue why they call CO2 a pollutant... but this online register is very interesting to consult. Look out for instance for Luxembourg's CH4 emissions. AGW Science Assessment Report (April 2013) The Right Climate Stuff is a research team of ex-NASA scientists: "Our main objective of determining to what extent CO2 concentrations in our atmosphere can cause detrimental global warming has led us to an objective conclusion that this issue is not settled science." Germany's Energy transition Experiment Germany's Energiewende: Read this sober and well written article in POWER magazine. System Effects in Low-carbon Electricity Systems OECD 2012 report (executive summary): "It is important to ensure the transparency of power generation costs at the system level when making policy decisions"
Climatologists are no Einsteins, says his successor. Read this article (with videos) on the great global warming skeptic, the Princeton physics professor Freeman Dyson. Speaking of CO2: "The vegation is commanding what's going on in the atmosphere". Household Solar Photovoltaics: Supplier of Marginal Abatement, or Primary Source of Low-Emission Power? Excellent Australian research paper by Graham Palmer on household photovoltaics (in Sustainability, March 2013): "Even with declining module costs, PV is not likely to be among the cheapest ways to abate emissions for the foreseeable future "
Das sozialistische Solar-Desaster Read this acide critique by Dr. Wolfram Weimer in the "Handeslblatt online" (03 May 2013): "Eine absahnende Szene aus Förderantragsexperten, Anlagenbauern und Subventionsverteilern hat sich in diesem öko-industriellen Sozialismus gut eingerichtet"
Are global wind power resource estimates overstated? Very interesting paper by Adams/Keith on the maximum power that can be delivered by huge wind farms: "..results suggest that estimates of global wind resource that ignore the impact of wind turbines on slowing the wind may substantially overestimate the total resource." Zero emission synfuel from seawater CO2 capture from seawater to make synfuel at 0.79 $/liter: read this article by John Morgan. Misinterpreted climate report threatens the credibility of scientists Swedish scientists slam misplaced PKI alarmism. The Manmade global warming Challenge Bob Tisdale has a very interesting presentation.The graphical aesthetics might not blow you out of your socks, but the content is very readable and tells a lot on ocean heat content and El Nino's (PDF, 42 MB). A Lukewarmer's Ten Tests Dr. Matt Riddley: "At the moment, it seems highly likely that the cure is worse than disease." Atomausstieg und Energiewende: Wie sinnvoll ist der deutsche Alleingang? 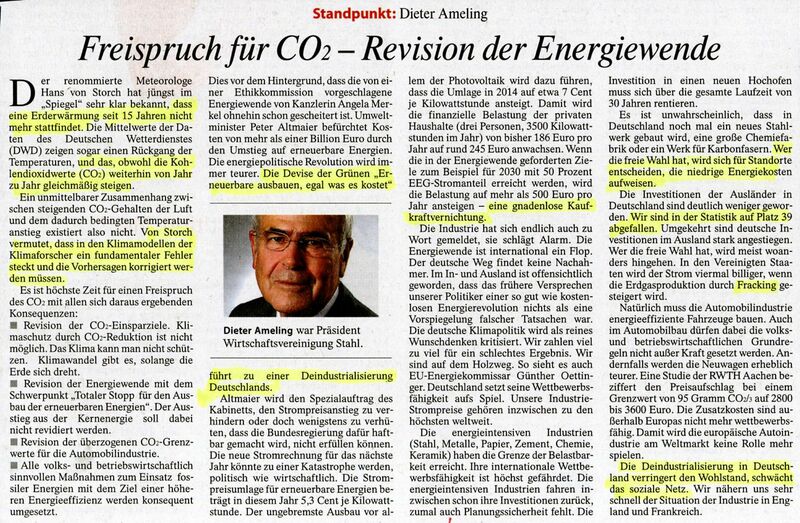 Prof. Weinmann (et, Energiewirtschaftliche Tagesfragen, Jan. 2013):"Die ökologische Wirkung der Förderung der erneuerbaren Energien ist praktisch gleich Null...Insgesamt fällt das Urteil über die Energiewende damit negativ aus. Es sieht sehr danach aus, dass es sich bei ihr tatsächlich eher um ein Produkt politischer Opportunität handelt..."
Preliminary report of the TRCS team of veteran NASA scientists on AGW "There is no convincing physical evidence of Catastrophic Anthropogenic Global Warming... Because there is no immediate threat of global warming requiring swift corrective action, we have time to study global climate changes and improve our prediction accuracy"
A New Estimate of the Average Earth Surface Land Temperature Spanning 1753 to 2011 The BEST project paper: DTR trend (diurnal temperature range) = a fingerprint of global warming remains flat since 2002 (climate models say it should decline). The trends from the meteoLCD measurements show the same behaviour! See also the BLOG. Global Warming, the tool of the West Pravda comment (04Jan13): "... the elites moved to use this new "science" to guilt trip and scare monger their populations into smaller and more conservatives forms of living." Erster Monitoringbericht "Energie der Zukunft" 2012 The German Bundesnetzagentur has published its first monitoring report (see here). Especially useful is the addendum, a huge Excel-file with many relevant data.